Above is the flag according the constitution provisions. Same image is feautured in the arms. The 8 pointed yellow star is the supposed original flag of the republic of Cartagena was described only after that the provincial flag was already adopted. When the provincial flag was adopted the Cartagena republic flag was reconstructed as the above and was adopted as such. I live in Barranquilla, Atlantico, Colombia. A green, red-white-fringed, five-point star flag is the flag of the city of Barranquilla, and the 8 Points Star Version is one is the Cartagena's. Cartagena is the capital of the Bolivar department. 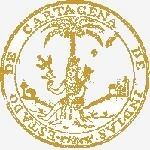 At the official site <www.alcaldiadecartagena.com> , one can see the municipal symbols. Note the shape of the star and the respective proportions of the rectanglesas as opposed to the Previously Reported Flag. "FLAG CUADRILONGA - With the independence and the formation of the Sovereign State of Cartagena, in 1812, along with the republican shield, a republican flag was adopted composed of three rectangles or longos squares (for that reason it is called cuadrilonga ), of colors red, yellow and green and in its center a white tienuna stars of eight points. It had been speculated on the meaning of the three rectangles; on the three used colors and the mentioned star. Nevertheless, it was not been possible to find no document that indicates such meaning with exactitude . Until now the version that seems best guessed right is that the eight ends of the star correspond to the eight provinces that originally formed the Sovereign State of Cartagena. In any case, the Cuadrilonga Flag had an outstanding figuration as the one to be taken as standard by Bolivar when in 1812 he undertook the so-called Admirable Campaign from Cartagena which culminated with the liberation of Caracas, to which the liberator arrived with the flag of Cartagena in his hands. It is the same flag of Barranquilla, being the Flag of the State (old Province) of Cartagena, of which that city was part." The flag I remember have seen flying is more alike the Previously Reported Flag, than the newly reported one. I have a photo that I took last time I was in Cartagena (last year), and it seems to agree with the proportions of the previusly reported flag, and the shade of green is similar to the one from Barranquilla or the historical flag of Cartagena. I have found two sites: <www.cartagena.com.co> and <www.cartagenacaribe.com>, each with a different version of the flag. I am pretty sure that the cuadrilonga's vertical and horizontal strips are the same width. Most flags displayed in Cartagena do show a diference of Barranquilla and historical Cartagena flag. : non of the points in the star points to the top. as shown in <www.cartagenacaribe.com> . I do not know, however, if there is an official difference. Note: Cartagena City changed its Coat of Arms. This one is probably the previous CoA. 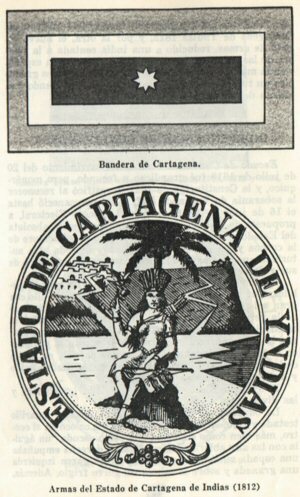 Recently there have been a debate about changing the coat of arms of Cartagena. The one above has been the CoA since 1574, with a few interruptions. The mayor wants to change the CoA for the one used by the independentists in 1812. While the first one (also known as "colonial") is the most known, some historians agree that both the "colonial" and the "republican" are current coats of arms of Cartagena. See also <www.cartagena.com.co> and <www.cartagenacaribe.com>. See also image Colonial Coat of Arms from: GARCÍA, Julio Cesar. "Himnos y Símbolos de Nuestra Colombia". Camer Editores. 2000, and image of Republican Coat of Arms and the flasg from a book by Evangelista Quintana Rentería.